Do you ever feel like a late bloomer? You're in good company here. I started college late, changed my major three times and so took longer getting through, didn't start on my first career until my late 20's, and didn't get married until my early 30's. Now, in my early 40's, I have an elementary-school-aged child and many mom friends who are anywhere from two to fourteen years younger than I. And it's taken me an awfully long time to write a novel. Or two. Late bloomer? Compared to others in my present peer circle, most definitely. But lately I have encouraged by this realization: It's not so much about how quickly I attain to certain milestones in life. It's about resting in the Lord through the journey. Throughout John 15, Jesus emphasizes the importance of abiding in Him. "As the branch cannot bear fruit of itself, unless it abides in the vine, neither can you, unless you abide in me (vs. 4)." In the Key Word Study Bible, one of the lexical definitions of 'abide' derives from 'humpeno': to remain under, be patient. Here's the cool thing about humpeno. I believe that as we "remain under" the Lord's hand through the waiting, we begin to realize that relationship with Him is dearer than anything we can attain. And that's when we bear fruit that lasts. We don't care anymore what we can do for Him. We just want to be with Him, where anything is possible. All in good time. So wait on, dear ones. He'll make it all worth it. This has been my blogging life for the last year and a half ... a shocking lack of words. For those who may have caught the reference, I did indeed borrow the title above from Emma. Remember the last scene, when Emma and Mr. Nightly walked out of the church, under the arbor, and the ever-critical Mrs. Elton turned to the camera and remarked at the "shocking lack of satin?" Like anyone in the presence of such loveliness as Gwyneth Paltrow and Jeremy Northam even noticed! Still, I’m compelled to give a reason for my absence. Though writers are not supposed to have excuses, I've been sidelined for many months by a lingering bout of vertigo. If you've ever experienced that thoroughly consuming affliction, you know that vertigo + computer screen does not equal a happy head. And then, in blogger-land, there's that thing about saying something useful. I admit to being the type who is finicky about the “rules.” All the advice, instruction, how-to-do-this-thing-the-right-way messages I’ve received at writing conferences has fed my inbred hypersensitivity. Contributions to the blogosphere should be purposeful, poignant, applicable, or humorous. Preferably all of the above. When I was in college, a friend and her boyfriend came to visit over Christmas break. Around the dinner table one night, my dear mother, perhaps because she felt she must share something, leaned toward me and said, "I bought you some underwear today." My friend just about spit her mouthful of food all over her plate! Not to be confused with the Exterminator or Silencer or whatever the name of that show was--the rogue good-guy who always got his man. This is simply a shameless promotion for a fun summer read. 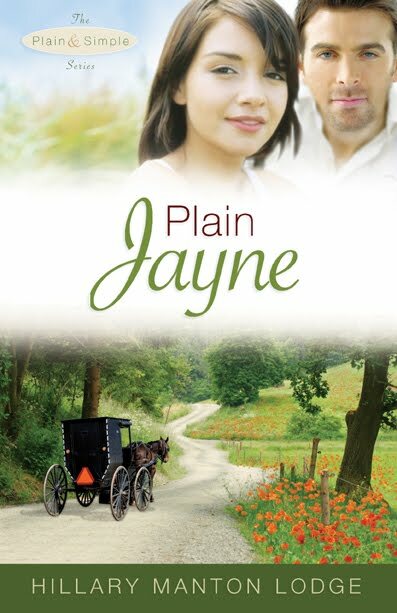 The blurb: Hillary Manton Lodge's Plain Jayne is the story of newspaper reporter Jayne Tate, who escapes to Oregon Amish Country, seeking solace and maybe a big story. But what's a latte-drinking, laptop-using, motorcycle-riding reporter to do when this life starts to change her? I say read the book and find out! I love this story for its fast pace, tight dialogue, and new twist on a much-used subject in Christian fiction. Hillary does a great job crafting characters with quirks and conflicts. She opens a window into the modern life of the Amish and gives us a glimpse of the tension between their world and our own. Her writing is all sprinkled through with personality--clever humor and catchy voice and not an adverb in sight! :-) Well, maybe one or two. My point, though, is that her sentences sing with action verbs. And there's more! Her second novel in the Plain and Simple series, Simply Sara, comes out in September. (Thanks for the alliteration there, Hillary.) I'm looking forward to spending another evening or three with a familiar cast. Yes, I did say evening or three. Don't be surprised. I told you her writing is fast-paced. No, not John Wayne. I'm referring to my brother. Have you seen the Two Weeks in Hell series on the Discovery Channel? It's a peek into the Green Beret Training Camp. My older brother ... been there, done that. At the time my bro went through that training, he was in his mid-twenties and in the best shape, he says, he's ever been in. And yet, twenty years later, he believes that if his younger self met his older self in a fight, the elder would win. (Why they would fight I have no idea. My focus is on age, here.) "Something to be said for experience and mental toughness." As I inch a little farther into my forties, I find myself gazing longingly at those still noodling around in the decade just previous to mine. Deep down, I know what I'm doing ... Placing the knowledge and growth of me-now- on that 30-something self and wishing I could have been just a little bit wiser. But it doesn't work that way, does it? We learn as we add the years to our lives, and there's a process and timing for all our seasons in the Lord. Moses was eighty years old when God called him to deliver the Israelites. Zacharias and Elizabeth were well past the baby-having stage, for their culture, when they had John. David was an old man when he wrote some of his most poignant and powerful Psalms. I love this from C.S. Lewis' Screwtape Letters: "He [God--from the demon Wormwood's persepective, the Enemy] would have them continually concerned either with eternity ... or with the Present--either meditating on their eternal union with, or separation from, Himself, or else obeying the present voice of conscience, bearing the present cross, receiving the present grace, giving thanks for the present pleasure. ... [T]he Present is all lit up with eternal rays." "The Present is all lit up with eternal rays." The Present. Eternity. That's a good place to rest in as I walk toward the future. Everywhere I look it seems I meet a person in need. Last night on the news, I heard that in the state of Oregon, one in five households have applied for food stamps. Many who have never used state services are now unable to meet their monthly bills without them. It's crazy times. And crazy times call for crazy faith. Here's my highly theological understanding of crazy faith: It simply receives. Receives the calling one has been given, without worrying about the outcome. Receives his Word as Truth, resting in (and often clinging to) the promises he gives as we ask for direction. Receives provision for our daily needs, with thankfulness and without guilt that we can't give anything back. I was blown away the other day by the power of like. Consider this verse: Psalm 37:23--"The steps of a man are established by the Lord, and He delights in his way." The lexical definition for 'delights' from Strong's Key Word Study Bible: "to find pleasure, to take delight in, to be pleased with. Either man or God may have this feeling. It means to like someone or something very, very much." How many of us have ever said of our children (or, ahem!) another family member, "I love _________, but I don't really like him/her right now"? In our Christian walk, we are well-schooled in the love of God. We know "God so loved the world that he gave his only begotten son" so well we could recite it in our sleep. And that is an awesome, beautiful, all-encompassing love. But do we ever think about how he delights in us? Delight in a relationship speaks of the intimacy of it. So back to this crazy faith idea. If our steps are established by the Lord, and he likes what he has established very, very much, then we can rest assured that he will see us down our path, however dark it may seem. Without excuse or further ado, I'll just jump back into the blogging stratosphere after a nearly four month hiatus. Whew! Good thing I don't have a huge fan base yet. I might have lost everyone and had to start over. My mom is staying with us this month, recovering from a broken hip. With her surprising decline over the past two years (the woman has been running at break-neck pace for almost eighty years) and my dad's death at the end of December, I have been thinking about that story in scripture when Mary pours expensive perfume all over Jesus's feet. Judas rebukes her, but Jesus receives her gift--"Leave her alone. It was intended that she should save this perfume for the day of my burial." (John 12:7) I love that image of a rich gift poured out on a life that is drawing to a close. Not wasted, but purposeful and intimate and, Jesus knew, motivated by love. We had a week with my dad before he died. A week for my siblings and me to pour out on him the perfume of our love. Though he was unresponsive, I know he heard us and knew we were there. I know it prepared him for his burial. And us, for his passing. I recognize it is not always easy. That week with Dad was as wrenching as it was beautiful. Mom has been diagnosed with Multiple System Atrophy, a type of Parkinson's in which the body is in a constant state of degeneration. She's plugging along pretty well right now, but her needs are many and varied, and well, let's just say she's the type who is not shy about voicing said needs. (wink) Still, that image returns ... the woman with the jar of costly nard, pouring out what she had to bless the one she loved. It seems meet and right to go and do likewise.